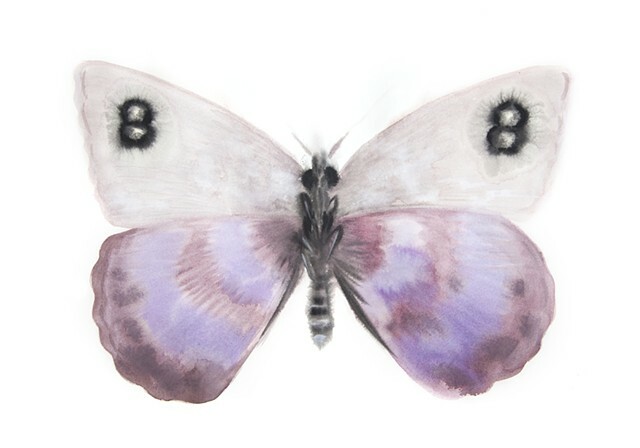 In Father's Butterflies, Nabokov wrote: "[I am] especially captivated by an accurate portrayal of the priceless, utterly frayed and faded, single specimen of 'Godunov's Erebia' ever found on the face of the earth, 'amid dense leafy woods, July 8, 1903.' Of course, there never was such a butterfly, although the Erebia is itself a real genus of Holarctic brush-footed butterflies with around a hundred species. I've chosen to make this invented species a fanciful lavender, rather than the more typical mauvish-brown.